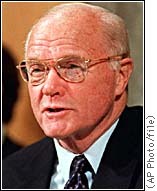 John Glenn Returns to Space! John Glenn, 77, the first American to orbit Earth, soared back into space aboard Space Shuttle Discovery Oct. 29. Glenn, a private racing pilot, and a Democratic senator from Ohio, first blasted off to space on Feb. 20, 1962 in the Friendship 7 capsule. 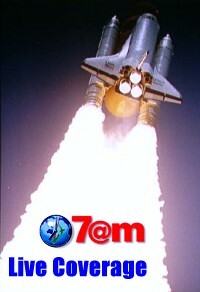 One of the original 7 U.S. astronauts, Glenn flew as part of the Mercury space program, and was the third astronaut to blast off from the then-new Cape Canaveral NASA facility on Florida's East Coast. Glenn was one of the group Tom Wolfe wrote of in his book _The Right Stuff_, later made into a popular movie. "The right stuff" was a term that took hold of America's consciousness through both the movie and the simpleness of the pilot jargon itself. "The right stuff" aptly and succinctly summarized the mixture of courage, experience, physical conditioning, attitude, and brain power that created the kind of astronaut who could not only dare the risk of those first flights, but also help to shape America's future in space through their reporting and suggestions for improvement. Make no mistake about it: test boosters for that early program often blew up, sometimes while the astronaut slated to fly atop the next production models watched. Space, during the Mercury program, was a lonely, solitary business. One man, rigged for medical tests, cocooned in an oxygen-dependent spacesuit, was strapped into a metal can, and blasted into the then-unknown environment of space. It's no wonder that the astronauts sometimes called themselves "spam in a can." The blockhouse where scientists and flight personnel monitored those first flights still stands on what is now Cape Canaveral Air Force Station, just down the road from the Kennedy Space Center, and miles from where today's Space Shuttle, which carry several crew members and all the facilities of home, now routinely lift off. There's an interesting and little-known note about that blockhouse: the actual work area was sealed in hours before liftoff behind blast doors, just a few paces away from the regular outside doors. Too late, they realized that the bathrooms were outside the blast doors, leaving the launch team to appreciate the sufferings of the astronaut who waited hours for liftoff, rumbled into space, performed his mission, and then got catapulted into the ocean to await pickup of his capsule--without a bathroom. Most people don't realize how earthy space flight is: it's camping in space added to risking your life. Simple. Back in those days, in the heat of the Russian space race, the emphasis was the same as that put on test pilots at Edward Air Force Base in California: fly higher, faster, stronger, better, than anyone before--and live to report the data. And, here's how he looked inside that capsule. Here's what his 1998 ride looked like, courtesy of Steve Sponsler at the NASA Space Station Processing Facility. 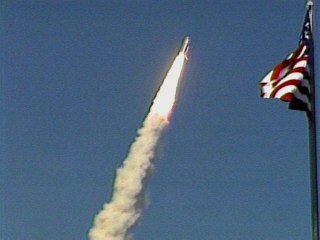 This is a video image of Discovery's launch. Glenn's next space mission has serious scientific goals: to study how space affects an older person--and how the older person adapts to space. Such studies could help all of us as we age; even more specifically, the understanding of these processes, and how freedom from gravity might change that process, could be crucial for those with such diseases as the multiple categories of arthritic disease. Congratulations to NASA for having "the right stuff" to lift a 77-year-old voyager back up where he belongs! we say again: God speed. I'm proud to say that I am a former NASA Public Information Officer, KSC Launch Team, Space Shuttle era, and a journalist who often writes about space. Oct.14, 1947--Well, the hoopla over the 50-year anniversary is over, but the accomplishment remains. Chuck Yeager breaks the sound barrier flying the X-1 and mankind's leap toward the universe will never be the same. Many experts, relying on "irrefutable"data believed that the sound barrier was real--like an invisible wall in the sky--and that no one could get past it. Sometimes what's needed is a little less reliance on data, and a lot more guts and faith. So here's to two men with guts: Chuck Yeager and John Glenn. The music for this page is "Let's Twist Again." By the way, the twist really took off in the nightclubs of Cape Canaveral, FL during those space boom years. Rock 'n roll lives at Memphis Jan's midi collection where I got this musical blast from the past!